If you get a notice or a query from the Income- tax (I- T) department, reply to it, even if it seems meaningless. Under the new black money law or Undisclosed Foreign Income and Assets Act, not replying to a query can attract a penalty of Rs. 2 lakh. Currently, penalty is levied for not cooperating (not responding on time despite multiple notices), not filing returns on time, concealing or under- reporting of income. The penalty in such cases plus interest can be 100- 300 per cent of the tax amount payable. “If summons are issued and if the taxpayer does not respond, it can be considered contempt of court and action can be taken as in a civil case, says Divakar Vijay sarthy, co- founder of Meet Ur Pro, an online platform for investment and tax requirements. Ideally, prior to issuing a demand notice for not paying a certain amount of tax, the I- T department should issue an order showing how the amount was arrived at. But if the tax- payer receives the demand notice without the order, he should immediately respond saying so. If not, in case of an appeal later on, the I- T department can say that in their records, the order had been sent to the tax- payer and levy a penalty for every month of delay. Similarly, if you receive a notice asking for certain details, but you require time for collecting documents, then send a response requesting additional time. “ At the end of the day, it is communication from the government and one should not ignore it. If you need time to collect receipts for payments or bank statements, ask for time. 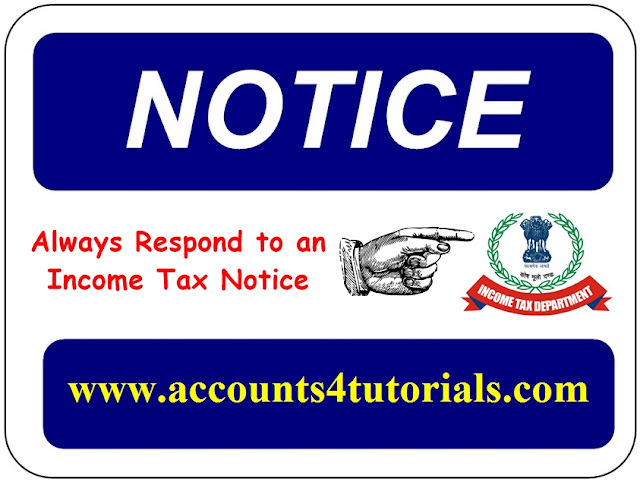 A reply is essential to keep record of the communication,” says Arvind Rao, a Mumbai- based chartered accountant. Individual tax- payers could get notices in case of a loan or a cash gift from a relative. The I- T department might want to crosscheck that the amount is reflected in books of both the giver and receiver. In case of property transactions, if there is a huge cash receipt in the books of the builder, the I- T department could ask the property buyer about the amount and its source. If there is a mismatch, it can result in a notice from the department about concealing income. Notices related to business income or capital gains are also common. Businessmen typically get notices in relation to third- party transactions, such as payments made for products or services. Or the I- T department might get information from the sales- tax department about bills without purchase and send a notice to the businessman for deliberately showing lower profit. Among other things, while responding to a tax query, always list out all enclosures and annexures with page numbering and get an acknowledgment from the assessing office. " Mention details like the number of pages because later on there should be no complaints of missing pages, says Amol Mishra, tax head, my IT return. com. Ideally, one should always maintain a bank summary and cash book. Especially businessmen, since they should be able to justify transactions to the satisfaction of the assessing officer ( AO), Mishra adds. Your response should always have a covering letter. Include details such as PAN number, reference number of the notice, date of the notice, which assessment year the query is related to and the specific issue. You might also have to show proof of income, bank statement, and mutual fund portfolio, if required. Sometimes the query can come from the Centralised Processing Cell (CPC), in which case you can file a revised return online. In that case, keep the acknowledgment that is generated as proof. Since online filing of returns has been made compulsory, several tax- payers have been receiving queries related to previous years. This is because the AO has raised a demand and intimated the CPC. The CPC keeps sending demand notices to the tax- payer. In such a case, you have no option but to respond to both AO and the CPC.